How it Works The stain remover tackles tough stains in the wash from 30°C and the special whitening agents give the whites back their original brightness. The special anti-greying system avoids particles of dirt, detergent and dust re-depositing on clothes to fight the greying of whites. To keep your whites white, it is recommended to use a sachet in every wash. Before For whites that are stained, grey or discoloured. In Wash The unique sachet releases whitening and stain removing agents. 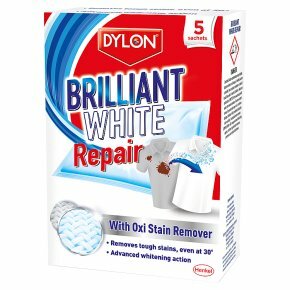 After Brilliant whites, with no stains! The Proof is on the Sachet® It's turned white, just like your washing! How to Use Machine Wash Place the sachet into the back of the machine drum before adding your washing*. Add detergent as usual and wash as normal referring to the washing instructions on the garment care label. At the end of the cycle remove and dispose of the used sachet. Suitable for all temperatures, even for short washes. *Always adapt the number of sachets to the quantity of washing. In the case of heavily soiled laundry use two sachets. Hand Wash The product can also be used for hand washing or for pre-treating tough stains. Add 1 sachet to 2 litres of water (max 40°C) together with the clothes. Soak for up to 6 hours, stirring from time to time. Rubber gloves should be worn for all hand use. PRECAUTIONS<br>Always place the sachet in the drum before the laundry.<br>Use each sachet only once. Do not cut or perforate the sachet.<br>Do not leave unused sachets out of the box.<br>Do not use in the tumble dryer. If using a washer/dryer take out the sachet before the start of the dryer cycle.<br>Always follow the washing instructions on the garment care label and the washing machine manufacturer's instructions.<br>Do not use on garments with leather, plastic or metallic parts.<br>Effectiveness cannot be guaranteed in all conditions.<br><br>DANGER<br>Contains Sodium carbonate peroxyhydrate. Harmful if swallowed. Causes serious eye damage. If medical advice is needed, have product container or label at hand. Keep out of reach of children. Keep only in original container. Do not breathe dust. Do not eat, drink or smoke when using this product. Wear protective gloves/eye protection. IF SWALLOWED: Call a POISON CENTER or doctor / physician if you feel unwell. Rinse mouth. IF IN EYES: Rinse cautiously with water for several minutes. Remove contact lenses, if present and easy to do. Continue rinsing. Immediately call a POISON CENTER or doctor/physician. Dispose of contents/container in a accordance with local / national regulations. COMPOSITION: >30% oxygen-based bleaching agents, enzymes (may produce an allergic reaction), perfumes and optical brightener.